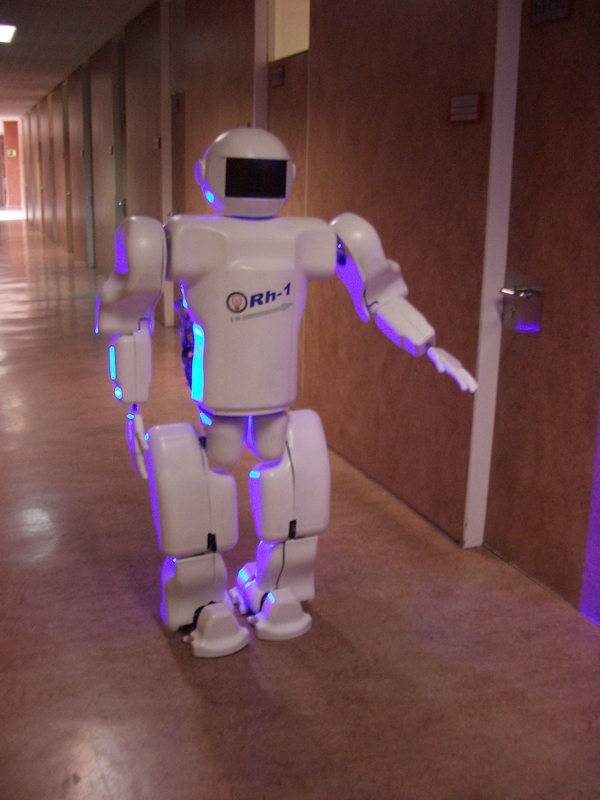 The humanoid robot Rh-0 (and its actualization Rh-1) is full size (1.3 m height, 21 DOF and about 50 kg weight) robot. The robot is equipped with two on-board CPUs and CAN bus communication system. Two batteries are also on-board which allows the 30 minutes of autonomy. The sensorial system of the robot is divided in two parts: 1) sensors for locomotion (accelerometers and inclinometers) and 2) sensors for interaction (camera and microphones). The HMI of the robot can works thought the friendly-oriented menus of the central computer or via voice commands. The control strategy of the robot is based on the Lie logic and PoE techniques. The robot?s gate is calculated in two phases: 1) by off-line dynamic gate generation using the developed VRT path planning module, and 2) by real-time modification of the gate using locomotion sensors feedback.